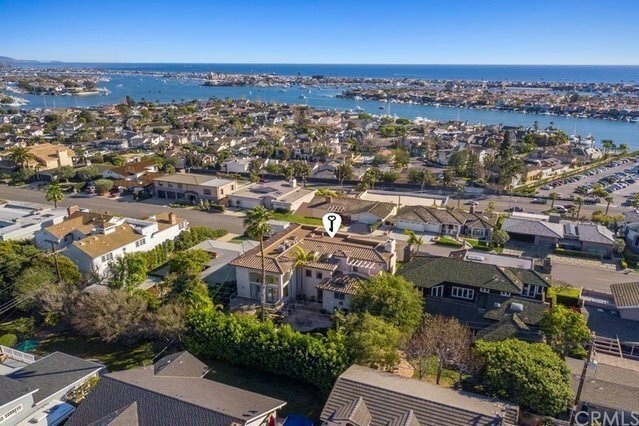 This Kings Road Mediterranean Revival style home is perched on a high point of the street and features one of the most spectacular Newport Harbor, ocean, city lights and coastline views in Newport Beach, extending from the Dana Point Headlands to the west end of Santa Catalina Island. The home which was completed in 1998 features over 5,300 square feet of living space with big open rooms, on three levels, and was sited so most of the rooms take advantage of the extraordinary views. The upper level of the home features a large living room with a fireplace, a formal dining area, marble flooring, an island kitchen with stainless steel appliances and custom cabinetry, a family room with built-ins, a workroom studio, a powder bath and two view balconies. The second level has a luxurious master suite with a sitting area and fireplace, two walk-in closets and a marble bath; two generous-sized guest bedrooms with an ensuite baths, a third bedroom, bath and a loft area. The lowest level of the home features a office with built-in bookcases, powder bath, a bedroom suite and bath and a huge 5-car attached garage with a workshop. The home has an elevator that services all levels of the house, multiple zones of heating and air conditioning, several balconies, handsome hardscaping and a large grass backyard with a built-in barbeque.